When thinking of Switzerland, a few things come to mind: Chocolate, watches, and the country’s unwavering neutrality. Switzerland has an impressive record of being the world’s longest standing neutral nation and has not taken a part in a war since 1505. In 1815, during The Congress of Vienna, the country officially proclaimed its stance of non-involvement. This has been true ever since and during both World Wars Switzerland managed to remain neutral. However, maintaining its neutrality has not been easy. Especially its ‘non-involvement’ in the Second World War has been heavily scrutinized since, particularly in terms of border controls, banking, and trade with Nazi Germany. 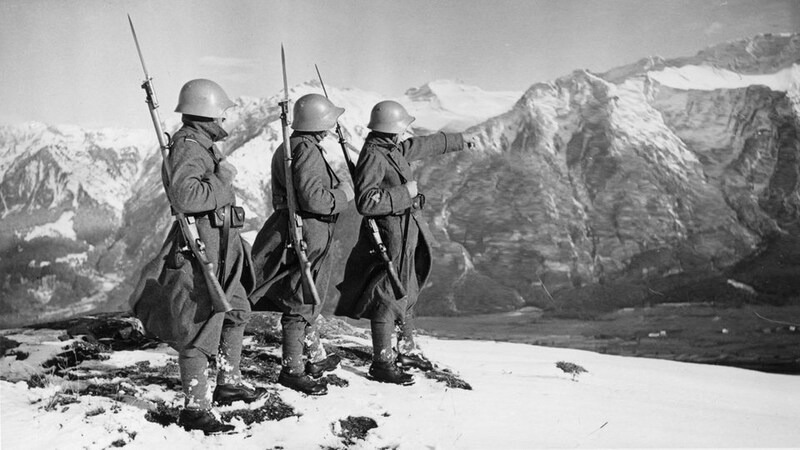 The main reason why Switzerland was able to remain neutral was thanks to the non-invasion of Hitler’s army. This, naturally, did not mean that Hitler had no intention of invading Switzerland, but rather that the cons outweighed the pros. Firstly, due to the rapid mobilization of the citizen army at the outbreak of the war in 1939, Switzerland became a difficult target. The Swiss invested heavily in their machinery, which, in addition to its naturally tough terrain, made the chances of a successful invasion slim for the German army. Secondly, Germany did not want to jeopardize its pre-existing trade partnership with Switzerland. The infamously neutral Swiss bank were beneficial to the Nazis. Yet, by 1940, Switzerland was completely surrounded by Axis powers and Nazi occupied land. Undoubtedly, this made it difficult to stay clear of the war. Subsequently, Switzerland allowed, and in certain ways, assisted the Nazis which made their so-called neutrality a subject of scrutiny. Despite its pledge to be a sanctuary for marginalized groups, Switzerland imposed strict laws to regulate the influx of Jewish refugees. For instance, the Swiss government taxed the Swiss Jewish community for any Jewish refugee they allowed into the country. On other instances, Jewish refugees were completely denied entry. One Swiss government official stated in an infamous speech that “our little life boat is full”, in an attempt to justify their regulations. Another controversial point of protection was the Swiss currency. The Swiss Franc was the only remaining freely convertible currency in the world until 1936. Both the Allies and Axis Powers, therefore, depended heavily on Switzerland’s economic stability. Obviously, accepting gold from both sides does not impede a country’s neutrality. However, it is the way in which the Swiss bank dealt with the large amount of gold, collected from Holocaust victims, after the war, which has been deemed immoral. Finally, Switzerland, as it was completely surrounded by Nazi held territory, had no choice but to cooperate with German trade policies. Reportedly, approximately 10,276,000 tons of coal was transported from Germany to Switzerland between 1939 and 1945. Evidently, the Swiss wanted to stay on good terms with Nazi Germany. It can thus be argued that Switzerland was not truly neutral during World War II. Yet, at a time of war, the notion of neutrality is arguably as relative as the notion of virtue itself. Some might argue that Switzerland aided Nazi Germany, while others would state that the Swiss simply had no other choice in order to maintain control over their country.